CARE began working in Mali in 1975 to help the government respond to an emergency. Our focus widened to programmes where local communities take the initiative in their own development. In all our work, we defend the rights of the most vulnerable and marginalised people to obtain basic services. We help women and children improve their lives through access to credit, opportunities to earn a living and access to quality education. We work to eliminate female genital mutilation, child labour and trafficking. We continue to respond to emergency situations when these arise and helped the government and other agencies halt the spread of Ebola in the country. Our emergency response is reaching more than half a million people in the regions of Mopti, Segou and Timbuktu. 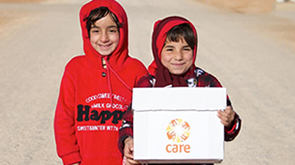 CARE, in coordination with the United Nations World Food Program, has distributed nearly 30,000 tons of food to 300,000 beneficiaries in these three regions, paying special attention to children under 5 and lactating women. We've also distributed blankets, tarps, cooking pots and utensils; supported farmers and families with seeds and tools to grow food (and helped construct gardens); and implemented cash-for-work programmes to help people generate an income while benefiting whole communities by rehabilitating dams and roads and constructing water and sanitation facilities.